Composing music is something that is beyond most of us, but for the talented few who can write music the Gocen offers some valuable help. 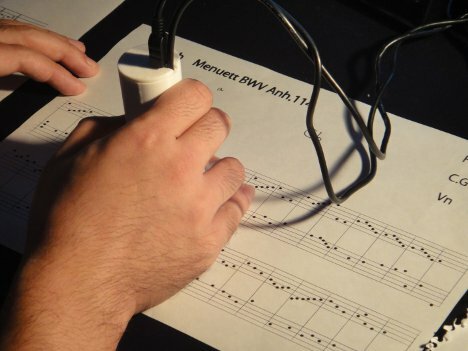 The small hand-held scanner is being developed by a team at Tokyo Metropolitan University to read sheet music in real time and play it back. As the scanner is held above each individual note, it reads the stave and notes, as well as the position and size of the notes. Using the OpenCV library, the scanner analyzes and reads the notes, creating an accurate computer-generated playback. The Gocen can even switch instruments when it sees the words “piano” or “guitar” in the notations. According to the team behind the novel device, the Gocen can help beginner musicians learn about musical notation by letting them write notes on a piece of paper – which is the easiest composing method – and play the piece back instantly with technology. See more in Computers or under Gadgets. November, 2012.